As a Korean, I grew up being relatively familiar with the effects of traditional eastern medicine and herbal ingredients. Yet, I was somewhat cynical of how exactly individual medications were concocted and where these ingredients came from. Observing the production of herbal medications from start to finish allowed me to profoundly understand the ethical principles of Jaseng and its emphasis on patient care and quality assurance. An hour-long tour of Jaseng’s herbal medicine dispensary in Seongnam begins with a cup of saeng-maek-san (생맥산), an herbal tea often enjoyed in the summer that contains omija (오미자), maekmoondong (맥문동), and ginseng designed to restore your energy from dehydration, heat exhaustion, and perspiration. The dispensary tours are open to the public, and are designed to establish integrity, trust and transparency to patients. 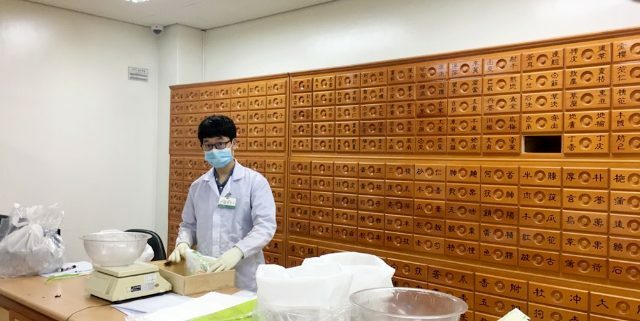 Prescriptions for 12 branches in the Seoul, metropolitan area are prepared in the Seongnam dispensary, and approximately 1000 prescriptions are produced per day. 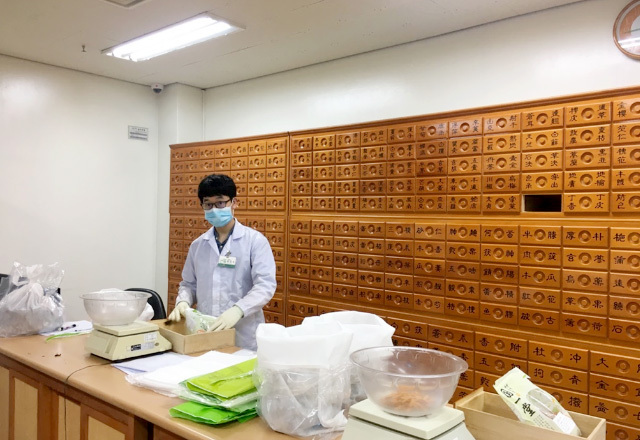 With 66 employees, ranging from pharmacists to delivery drivers, the Seongnam dispensary ensures a one-day delivery system so that patients can receive their medicine the morning after its prescription. As a result, many patients are concerned with how their prescriptions are made; often times they believe that their medicine is not personalized, made in bulk prior to prescription. The dispensary stresses the importance of individuality of each herbal medicine; the start of medicine production at Jaseng is an electronic prescription from a doctor from the 12 Jaseng branches. Once a unique prescription is sent to the dispensary, Korean medicine pharmacists inspect the prescription and prepare the herbal ingredients. Jaseng’s prioritization of quality assurance is evident in the dispensary medicine storage room. The storage room utilizes hardwood charcoal (참숯) to regulate the temperature and humidity level at the optimal state. It stores over 340 herbal ingredients that passed the standards set by the Ministry of Food & Drug Safety of Korea. One of Jaseng’s most common herbal ingredients is Nok-yong (녹용), or deer antler velvet. Deer antler velvet has been considered as a miracle medicine in the ancient Traditional Chinese Medicine system, and is known to enhance brain function, increase muscle mass and strength, bolster immunity, increase endurance, reduce joint pain and inflammation, and improve kidney and liver function. At Jaseng, antlers imported from Russia are used for a wide variety of medications, one of which is YooKongdan (육공단), a restorative medicine that improves the function of liver, heart and kidney and recovers the body from chronic fatigue syndrome. By carefully selecting only the best herbal ingredients from all over the world, Jaseng reassures the quality and safety of each herbal medicine. After the ingredients are prepared by pharmacists, they are extracted in the decoction room. Again, safety and quality are carefully prioritized, evident from the the use of purified water and specially designed pipes for optimal extraction and sanitation. Employees double check each pack of medicine to ensure that the labeling is correct, and that there are no machine errors. Up until packaging, the medicines are maintained at an optimal temperature of 90 degrees to produce the least bitter taste possible. The packages are then hand-delivered to each patient by Jaseng employees. The Namyangjoo (남양주) dispensary was established with the main purpose of scientific advancement of Korean medicine, along with herbal acupuncture (약침) standardization, herbal medicine modernization, systemization of quality control, and maximized production and efficiency. One of the most notable aspects of the Namyangjoo dispensary was its partnership with GMP Pharmaceutical, a Korean pharmaceutical company specializing in Korean herbal medicine. The Namyangjoo dispensary reassures the quality and safety of its herbal medicine in the laboratory, through various tests such as pH analysis, endotoxin analysis, and contamination monitoring. Moreover, chemical analyses are done via techniques such as mass spectrometry to ensure effectiveness and safety of every batch made at the dispensary. All in all, the utmost attention to detail as well as the amount of effort put into a single pack of medicine at Jaseng is astounding. After having toured Jaseng’s facilities, I can see with clarity that Jaseng has the highest standards for patient trust, safety, and quality of its medicine. If you are skeptical of Eastern medicine or want to learn more about the production process of herbal medicine, I encourage you to visit one of Jaseng’s dispensaries.